The capital city of Thailand, Bangkok, known for its great food, very affordable shopping and friendly people, which keeps people travelling back for more. The energy of Bangkok city is definitely apparent and alive as soon as you step out from the bus, but would not be ideal if you had to travel to get your tickets. It is quite time consuming to go through the traffic just to buy a bus ticket, so that is where Easybook comes in handy. 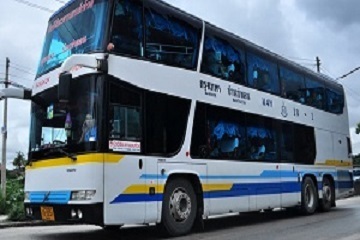 If you are looking to travel from Bangkok to Lampang or Chiang Mai, you can book your bus ticket online with ease now on our website with one of Thailand's finest bus company NewViriya Yarnyon Tour. Based in Bangkok Bus Terminal or also known as Mo Chit 2, NewViriya Yarnyon Tour bus concentrates on bus travelling between Bangkok to Lampang, as well as bus from Bangkok and Chiang Mai. Approximately 8 hour's drive from Bangkok, Lampang is known as the third biggest town in northern Thailand where you can find the amazing Thai Elephant Conservation Project located by Lampang-Chiang Mai Highway Hang Chat. As for Chiang Mai, it is the largest city in northern Thailand that is approximately 9 hours away from Bangkok with over 300 Buddhist temples for you to visit. With daily departures by NewViriya Yarnyon Tour bus, everyone is able to travel with the operator these days. Their vehicles are using double decker buses so you would be able to find yourself with roomy spaces during travels. Riding with NewViriya Yarnyon Tour will allow you to have a pleasant and comfortable journey whether you are planning to purchase bus tickets to go to Bangkok, Lampang or Chiang Mai. The traditional way of purchasing bus tickets would have been such an inconvenient experience where you will most likely go through the traffic to go to the bus terminal, queue up at the counter, then face another traffic upon leaving the terminal. Technology have made thing simpler for us these days when you can purchase anything through the internet, and you can even get your own NewViriya Yarnyon Tour bus ticket online. Over here at Easybook, we can ease the process for you. Just tell us your preferred pick-up and drop-off locations, plus travel time, in which we will do the rest for you. It’s as simple as that. You can also download our mobile app to book your bus ticket within minutes.